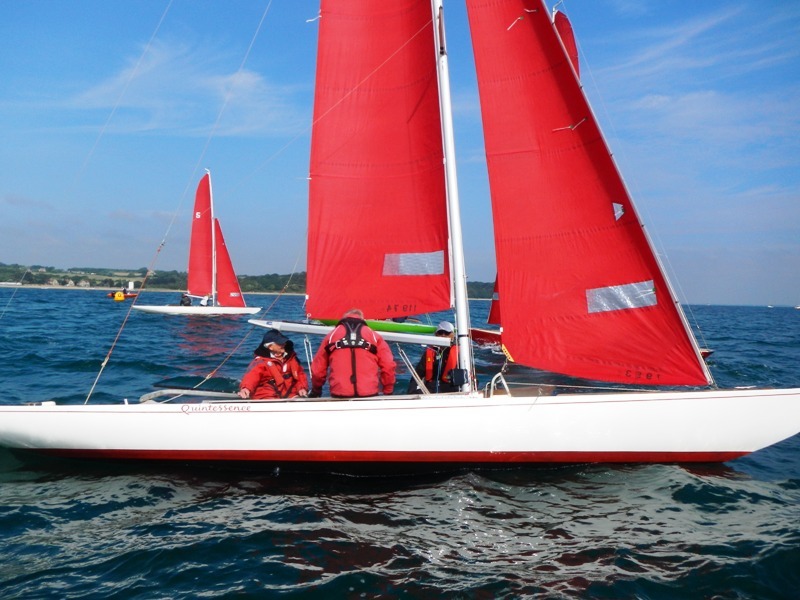 This year, four Redwings and five One-Designs signed up to head over to Chichester for the weekend hosted by Itchenor SC. There may have been more if it hadn’t clashed with a BSC member wedding in Bembridge. 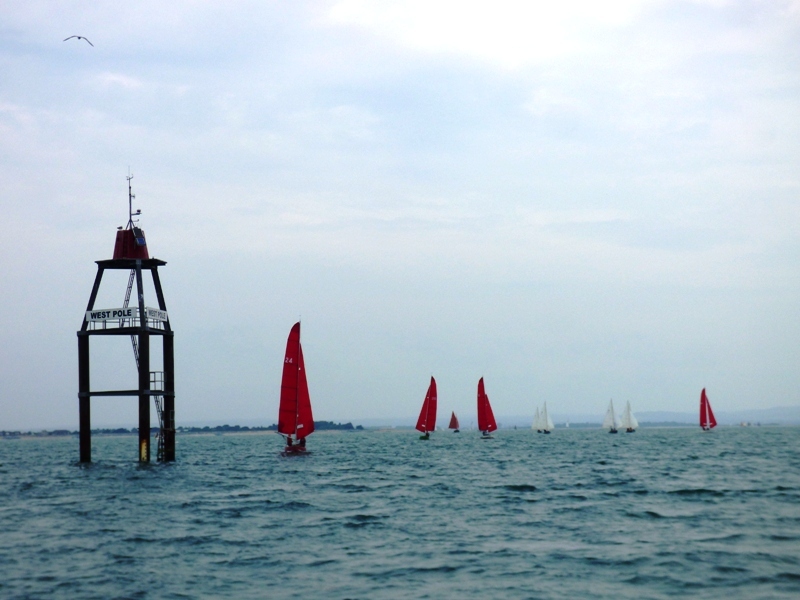 The passage race on Saturday morning followed the traditional course to Chichester via the Winner and West Pole. As in previous years, the location of the former (40º from St Helens Channel buoy!) tested both fleets and with the light NE’erly initially meaning it was a beat, the fleets soon split up and decided on varying routes. Most tacked onto port soon after the start at Garland and headed towards the Lifeboat Station to try to reduce the tidal effect; Rob Mathieson in No 1 BOD got it pretty spot on and reached Winner a country mile ahead of the other four One-Designs and indeed even rounded ahead of one of the Redwings. 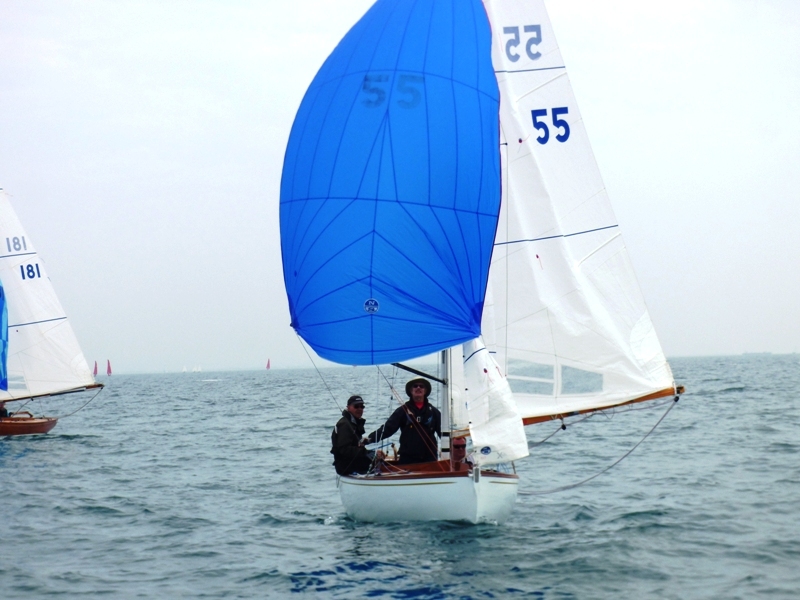 At times there was not much separating the front three Redwings, Joe Robertson in Red Gauntlet II, Mike Toogood in Tara (both of who were OCS and had to come back at the start) and Robin Ebsworth in Quintessence – indeed it looked at one stage as if Quintessence might be the first to reach the Winner, but it was not to be and first across the line at West Pole was Red Gauntlet II with Tara second. Martin Bonham in No 2 BOD was the second One-Design to finish and Ashley McLucas in No 6 was third. 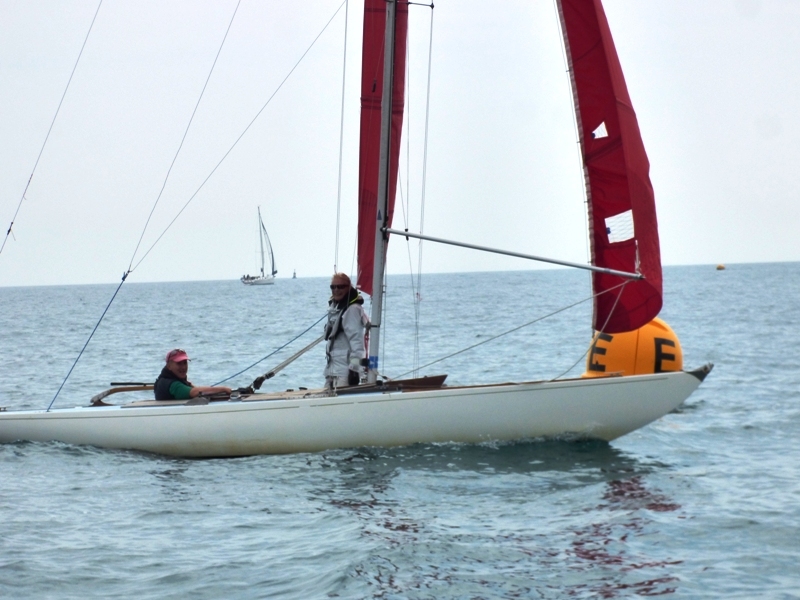 From West Pole to Itchenor SC was very slow going against the tide and the last One-Designs gratefully accepted a tow from Sea Breeze so that they could get ashore for lunch before heading back out for the afternoon’s in-harbour race. 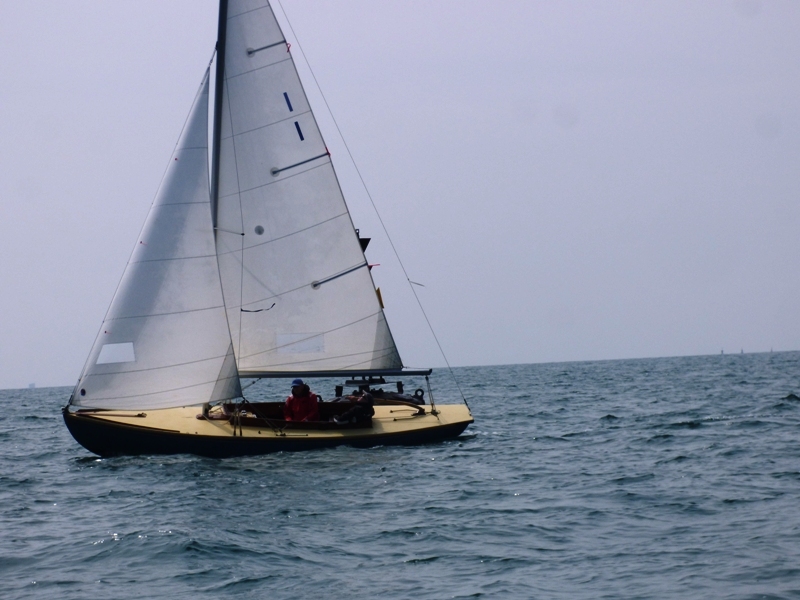 Probably as a result of the late arrival at Itchenor the traditional crew swap was a bit hit and miss with some boats having to race without an ISC guide onboard. 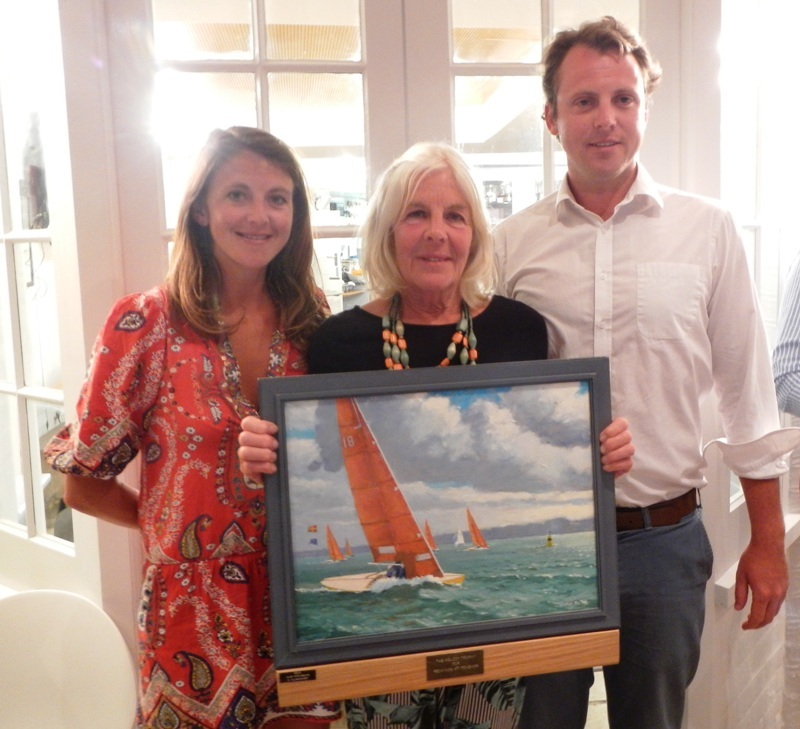 In the event, racing was almost abandoned when the Southerly breeze dropped away just after the Swallow start, however fortunately the RO stuck it out and everyone was rewarded with enough to make racing worthwhile. 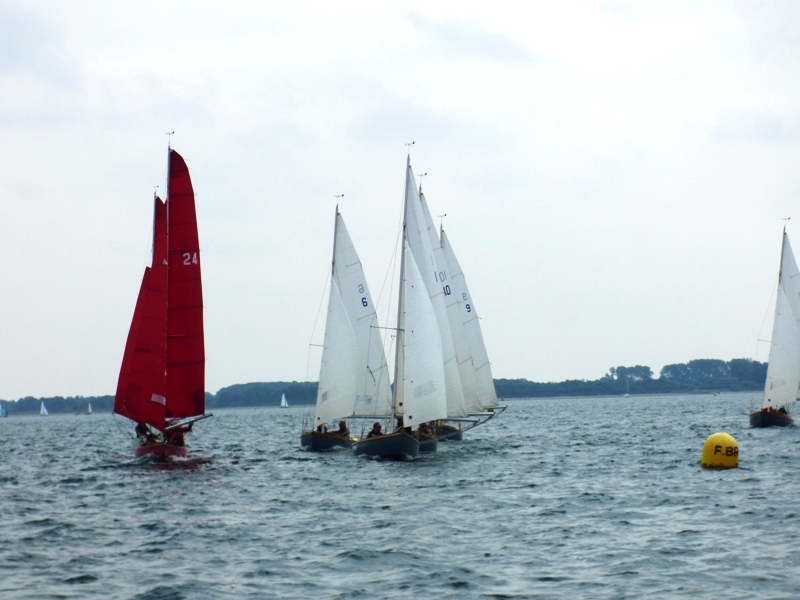 The four Redwings had a very close race and on the last leg to the finish any of the front three could have won. As it was, Joe Robertson in Red Gauntlet II (without a local guide) made it his second first of the day just ahead of Jonathan Nainby-Luxmoore in Snowgoose and Robin Ebsworth in Quintessence. In the One-Designs, the Stanley’s decided to sit it out so only four boats started. 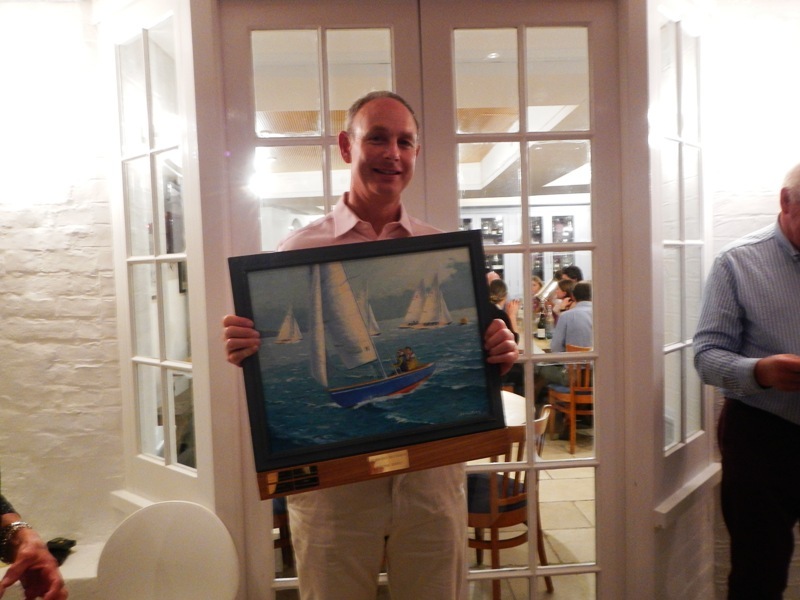 Having won the Trophy (a picture specially commissioned by Itchenor SC a few years ago) three out of the four years it has been raced for, the hot favourite was Peter Summerhays in No 1 however he had to be content with coming second just behind Ashley McLucas in No 6. Hugh Doherty in No 10 was third. 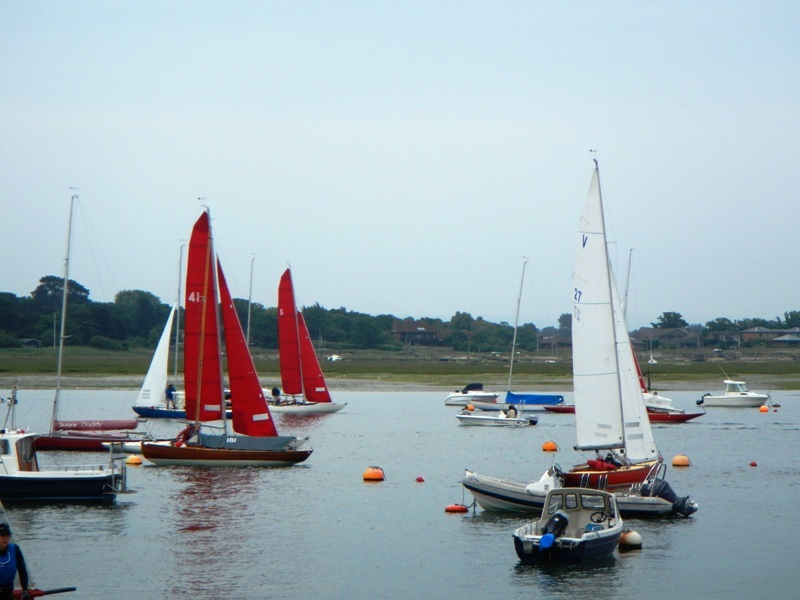 After a delicious dinner at Itchenor SC, no one was very late getting back to their overnight accommodation as the start of Sunday’s race back to Bembridge needed an early start to take advantage of the tides. Four X-boats, a reduction from the eight originally signed up, lead the way with their spinnakers filling nicely for what was predominantly a run all the way to Under Tyne. 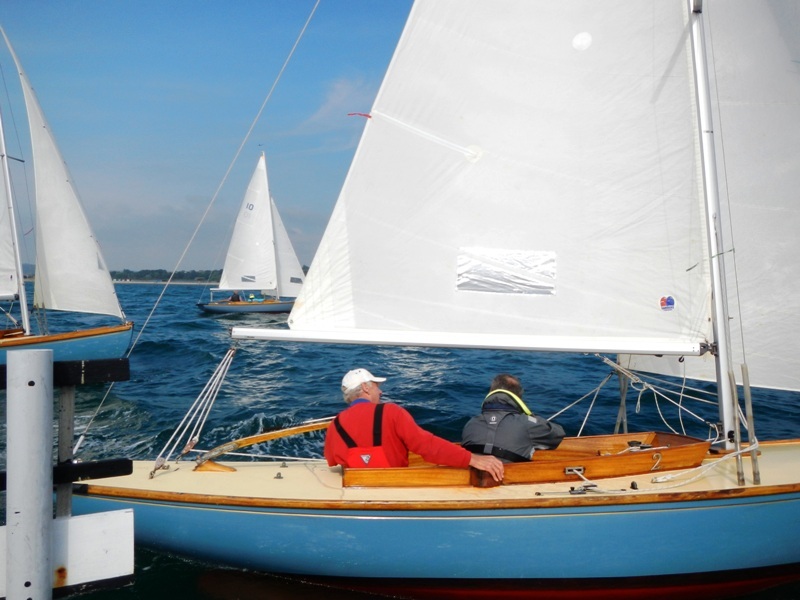 Martin Bonham in No 2 One-Design was the early leader in the One-Designs, but the rest had caught him, as had the four Redwings by the time the turning mark off Hayling Island SC was reached. 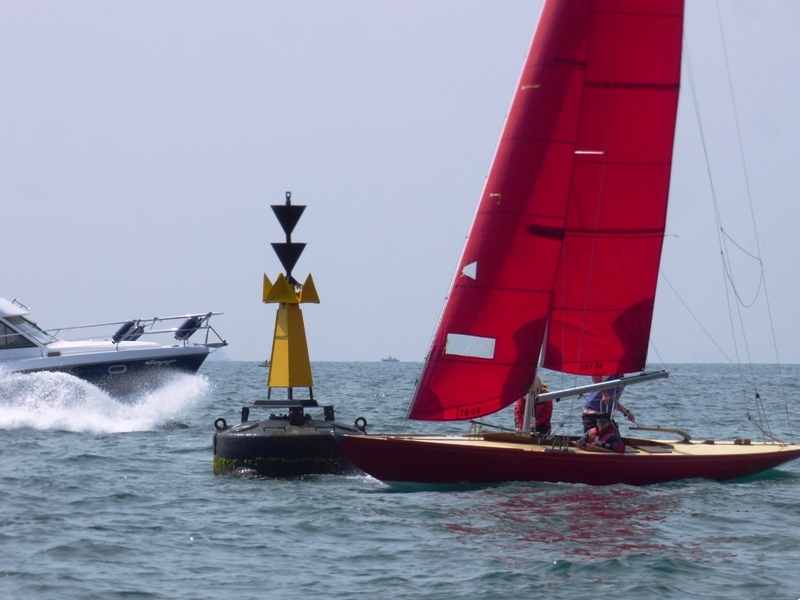 Joe Robertson in Red Gauntlet II looked as if he was going to make it a clean sweep however just short of the main shipping channel he was overtaken by Jonathan N-L in Snowgoose having had to take a detour to avoid the start line of a cruiser race. Tara was third. After a number of place changes earlier on, Rob Mathieson in No 1 BOD finished a minute ahead of Russ Fowler in No 6 with Hugh Doherty in No 10 third. The front three X-ODs meanwhile had had a very close race – indeed at times only inches separated David Palmer in No 188 & Sam Spencer in No 181. However, victory went to Alan Perry in No 55 who finished twenty eight seconds ahead of Sam with David third just over a minute later. Nail biting stuff after nearly two and a half hours racing! Another fun weekend and many thanks indeed to Itchenor SC for their hospitality.